After a disappointing run in the Jay Dix 10k on Saturday, I was hoping Sunday would be a great chance for some redemption. The duathlon was being held in New Town which is just outside of St Charles, MO. The race didn’t start until 10am Saturday morning which was great as that provided me plenty of time to get up early and watch the London Marathon on the internet! After watching Ryan Hall run a scintillating 2:06:17 taking 5th place, I was on my way to St. Louis to see what I could do on a cold and windy day with an occasional snow flake in the air! By the time the race was ready to start, the morning precipitation had subsided and all that remained was a steady breeze from the North and cool temperatures. Prior to the start of the race, I had talked with a fellow Big Shark teammate, Gregory Schrick and learned he planned on running in the low 5 minute per mile pace. Thinking he would be a bit too fast for me, I had decided I would concentrate on staying with Scott Shaw, the winner from the previous year who had beaten me by several minutes in a shorter race in September of last year (http://www.triathleteguru.com/blog/index.php?itemid=114). However, once the race had started, I found I was able to stay with Gregory without too much difficulty and so I did just that. We did the first mile in 5:45 and had opened up about a 10 second lead on the rest of the field. The final stretch of the 1.7 mile run headed into the wind so we slowed down a little and finished at 5:58 pace for that .7 mile stretch. Coming into the first transition, Gregory and I were running together, 17 seconds ahead of the next competitor and we had put 27 seconds into Scott. Of course I didn’t know any of these details at the time; all I was concerned with was transitioning as fast as possible and getting out on the bike. I had figured I would get crushed on the bike since I hadn’t trained much at all on it this year. The course was an out and back course, 9 miles out and 9 miles back for an 18 mile total. As I rode, I told myself the only chance I had to possibly win was to keep the lead until at least the halfway point on the bike, hopefully even longer. However, riding at the front of a race is tough as there is no “carrot” to chase. Instead I tried to use the fear of the unknown chaser to push me on. There were several short stretches of the course that turned and headed east briefly, at each of these turns I would quickly look back and try to gauge how my lead was holding up. I could tell a rider was gaining on me, but I slowly began to belief I had a chance to make it to at least the turn around! Finally, I reached the turn around and still hadn’t been passed. Of course the nicest part of a turn around is the ability to gauge gaps and it looked like I still had about a 30 second gap on the second placed rider, Scott Shaw. Now we had the wind at our back for the most part and the speeds quickly reflected that fact. While I was still trying to avoid the capture, at this point I was starting to feel a little more confident as I knew if I got passed now it was unlikely I would lose much time with the wind at our back. Had I been passed earlier, I might have given up a little psychologically, but at this point I was too invested in this fight. Eventually, I did get passed around mile 13, only 5 more to go! While the initial pass happened swiftly, I was able to respond and keep any type of substantial gap from opening beside the required 3 bike lengths. Now that I had a “carrot” to chase, the rest of the ride was much less stressful. About a mile from the finish of the bike, there was one final turn and Scott looked back. I think he was a little surprised to see me there right behind him and it seemed he picked up the pace to try and put some time into me. During the same stretch I began preparing for the transition, undoing my shoes and putting my feet on top of them. Eventually I pulled into T2 with an 8 second deficit on Scott. Since I had taken the time to remove my shoes, I was able to quickly sprint to my rack and would have had a very fast transition until my gloves kept me putting on my racing flats. Instead I had to quickly remove my gloves before I could finally slide my shoes one… Eventually they were on and I headed out to eliminate the 4 second lead Scott had. My legs felt surprisingly good heading out on the run, instead of the normal rubber leg feeling I felt like I was actually running! Within about 200 yards I had caught up to Scott. I briefly considered slowing up, afraid I might be going to fast and risk blowing up. But as I pulled up even with him I decided if I felt good I might as well keep the pressure up and go right on by. I can’t remember exactly what he said, but he said a few words of encouragement as I passed and I tried to do the same. My first mile off the bike was a 6:03 mile which is probably one of my fastest miles running straight off the bike! The final .7 mile stretch into the wind was considerably slower at 6:19 pace, but by that point the race was basically over. For the first time since 2005, I had won a multisport event! Super Congrats. Lets see some more of that this year and keep up with the blog posts. Starting this year, the Jay Dix Challenge to Cure run was now part of the Ultramax Series. This is the race series that I won in it’s inaugural year, 2004 and after several years of helping produce it, had returned to take second in 2007. Success in this series is a high priority for me, so naturally the Jay Dix 10k became an early focal point of my season.In 2007, I had narrowly edged Rodney Adkison for second place, despite never actually beating him in a race head to head. Rodney has been consistently faster than I am since the one time I beat him in 2004 and after I edged him for second in 07′ he informed me I was “going down” this year! Saturday, the day of the race arrived with cold and windy weather. The race started by heading east up Cherry Street, a steady climb of about a quarter of a mile. I quickly settled in behind Rodney deciding I would attempt to follow whatever pace he chose to run. The initial pace felt fine and we passed mile one at about 5:50. What had begun as a moderate pace was slowly increasing and my Garmin began to display a pace in the 5:30 per mile range. At this point I should have backed off and run my own race, but I decided to keep running directly behind Rodney and hope he backed off a little on the pace. We reached the turn around point of the first 5k loop and I was right on his heels but I began to fall off his pace at this point. By the end of the first loop I had fallen to about 45 seconds to a minute behind and was definitely hurting. My time for the first 5k was 18:16 which happened to be my fastest 5k time of the year and at that point I was still in second place, though Stephen Bourgeois was right on my heels. Within the first mile of the second loop, both Gerald Holtmeyer and then Stephen Bourgeois would pass me. At this point I was paying for running the first two miles at a pace too fast considering I was racing a 10k, not a 5k! Eventually I would finish in 4th place with a 38:08, 6:09 per mile pace. In 2007 Rodney ran the 10k and you ran the 5k. He was 2nd to Andy Pele. 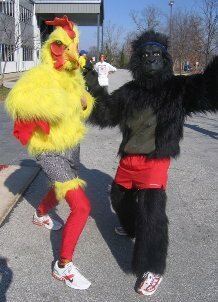 That is how I found myself on the starting line of a 4 mile race wearing a 10 lb full body gorilla suit. Vision and breathing were slightly compromised, but I was determined to put in a respectable time for a gorilla. Following the start, I surged into the lead with the chicken right next to me. For about 200 yards or so the chicken and gorilla led the race and then the heat started to build in the suits and the compromised breathing began to take effect. Slowly several runners attempted to pull up even to me and so I did what any gorilla would do, I moved in front of them and blocked their path! Eventually around 6 or 7 runners had passed me and I had settled into a sustainable pace, accounting for the semi-recycled air I was breathing. While most gorillas don’t wear shoes, this one was and unfortunately I hadn’t tied one of them well enough. After weighing the consequences and deciding a gorilla shouldn’t run with untied shoes, I stopped and attempted to tie my shoe. Unfortunately, my big fat gorilla hands were really made for tying shoes… Eventually after losing close to half a minute or so, I was back on the chase of these crazy human runners. The chicken had taken quite a lead on me by this point, but I was feeling good and just settled back into my sustainable pace. Eventually I caught up to the chicken who was running with a stereo system in his backpack, so he couldn;t hear me behind him. Also, as we all know chickens have limited vision in running races just like gorillas do, so I stayed directly behind him shifting sides if I saw the chicken head rotate to either side. After staying behind the chicken for about half a mile, I felt like it was time to put the hammer down on the chicken so I ran on past him, throwing in a suitable roar as I ran past. I only wish I could’ve seen that! My brother running in a gorilla suit! That would make my year! I really enjoyed reading about it and was impressed you came in 6th! Way to go, Tony!!! Miss you brother! Love you too!